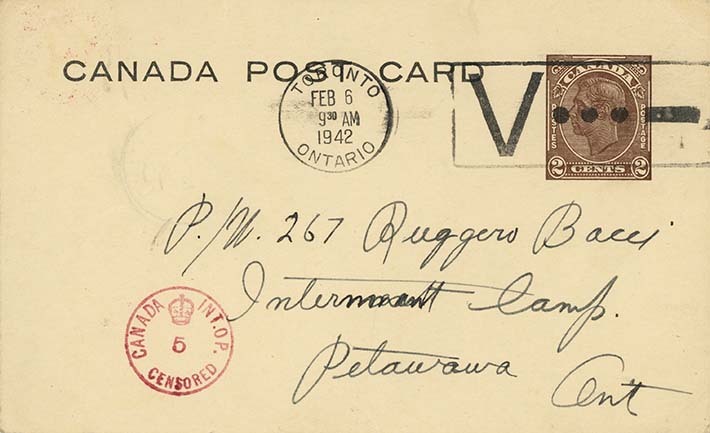 Postcard from Erminia (Minnie) Bacci, to her husband Ruggero Bacci, February 5, 1942.The postcard is written in English and is sent to Petawawa Internment Camp. In this letter, Minnie indicates that she will be seeing Bacci in person. Along with her sons, she seems to be planning a trip to Petawawa. During the early stages of internment, family visits were prohibited at the camps. As time passed, it does seem that in rare cases, family members travelled to Petawawa for a brief meeting with a husband or father.